What started with a fancy for textures in muddy footprints, extended to withered walls and gave rise to this unique body of artwork that expands in two Indian cities. Strokes of brown and splashes of green, beige tones for neutrality and blacks for depth – the artwork evokes the sense of the artist’s colour palette coming to life. Looking at the images that Shanthi Kasi produces, one would hardly believe that they are not hand paintings and are digital photographs instead! Kasi’s keen eye finds the lively artwork in the most mundane of spaces, ones that would usually be spotted to be unpleasant or in need of a make-over. 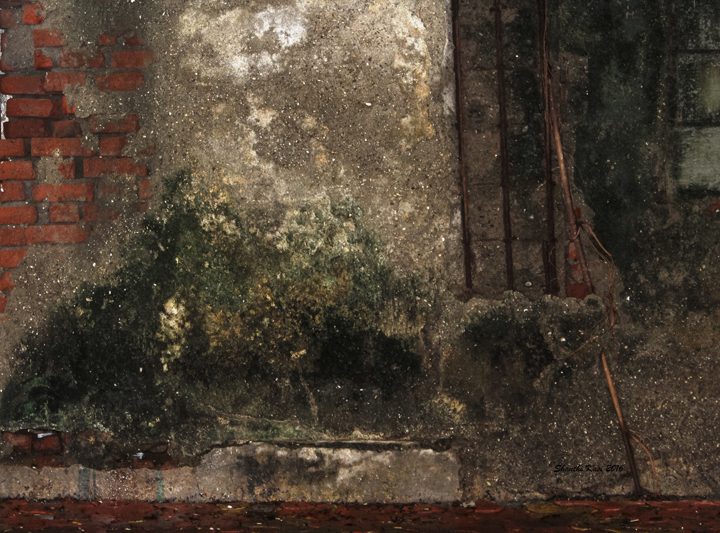 The artist from Mumbai photographs worn out walls that people are usually averse to looking and captures their unnoticed essence. 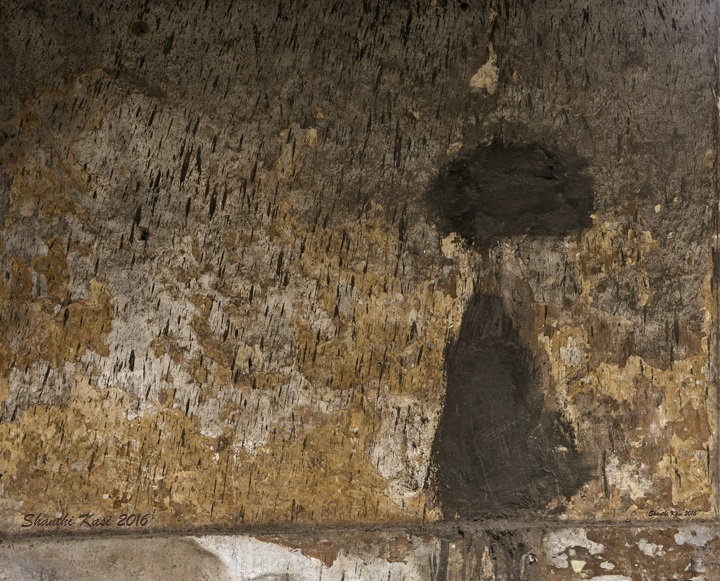 In these superficially dirty surfaces, the artist is able to see images that are reminiscent of western classical art and of European paintings from the 19th century. “What I search for is beauty or aesthetics that are usually not accessible in cities,” says Kasi as she tells us about her work, which she creates by photographing withering, old, worn-out walls in her city. A mundane element for many, the walls make for a unique body of work of the artist who has been able to extend her vision from one wall to the other and from one city to another. “One day as I was photographing some walls, I saw a visual that was complete in itself. It needed no erasure or rework. I had been photographing walls for three-four years and now started seeing visuals in them, which I was unable to see before. I had started by taking pictures of the walls of my hometown, Mumbai, before extending the body of work to Bengaluru,” says Kasi. Kasi goes about taking photographs of walls of residential buildings. “The buildings aren’t spectacular in any particular sense. They are the buildings that people pass by everyday without noticing. The walls of these buildings, shabby and run down, could be depressing to look at or even offend aesthetic proclivity. In such walls, I am able to see images that tell a story, images complete in themselves,” she says explaining how her photography work is an extension of her vision as a painter. “When I extended my work to Bengaluru, I did not know what to expect. On exploring the city, I noticed that there is a culture of painting walls there. There also is a culture of pasting posters on them. The degradation of these walls gave a completely different visual impact and thence arose a different series of work based on the same concept,” she adds. Kasi’s work with walls is rooted in her fascination for muddy footprints, the textures of which caught her imagination. She also started working with the textures or imprints in her palm, which even gave rise to a series of pencil and charcoal drawings by her. “It is a spontaneous and organic process. The resultant visuals resembled an aerial view of a mountain slope; some say it looks like a crowded city,” she adds. As with the hand imprint work, Kasi’s next series of works took off when she liked a wall that had its plaster peeling off. In her imagination she saw the wall as a snow clad mountain. “I would like to explore surfaces of spaces in different cities in India and abroad. The environmental impact of different climatic conditions on constructed surfaces would differ across geographies. The constructed surfaces would also differ across cities. The landscape, weather, people, culture, all these contribute to my work. As an artist, I am keen to explore and experiment,” Kasi concludes.